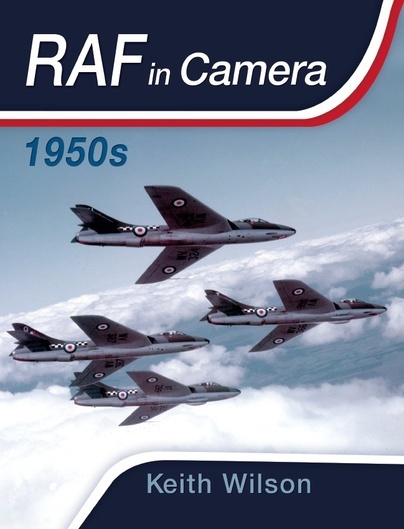 You'll be £35.00 closer to your next £10.00 credit when you purchase RAF in Camera: 1950s. What's this? For aviation, the 1950s was a fascinating decade. For the Royal Air Force, it witnessed the transition from propeller to jet in the fields of fighter, bomber, trainer and transport aircraft. The 1950s saw the end of the Second World War veterans – Lancasters, Spitfires, Mosquitoes and Sunderlands. They were replaced by the first generation of jet aircraft including the Vampire, Hunter, Javelin and, at the end of the decade, the English Electric P.1 – later named the Lightning. V-bomber force of Valiant, Victor and Vulcan. Another development was that of the nuclear weapon and this volume includes images and information from Operation Grapple, the testing of Britain's first live thermonuclear weapon – seventy times more powerful than that dropped on Hiroshima in 1945 – which was dropped from Vickers Valiant XD818 at Christmas Island on 15 May 1957. Another Cold War item featured is the Thor Intermediate-Range Ballistic Missile, three of which were located on their launches at twenty RAF bomber stations around the UK. 1953 saw the Coronation of HRH Queen Elizabeth II take place at Westminster Abbey on 2 June. Shortly afterwards, a Coronation Review of the Royal Air Force was organized at RAF Odiham, and many images of the never-to-be-repeated event are included here, as are details of all the 640 aircraft involved in the spectacular flypast that followed the royal inspection. Each chapter focuses on a specific year, relaying all the fascinating events and highlights. Lavishly illustrated from the archives of the Air Historical Branch, this is a colourful and insightful history, told with narrative flair and a clear passion for the subject matter. The color-NB iconography of this large book is very complete and accompanied by an informative text, all of which make it possible to form an overall idea of ​​the RAF during this decade. These volumes are beautifully produced and are ideal for browsing on a wide variety of subjects and localities. Highly recommended. If you want to wallow in nostalgia for a few hours, these books would be perfect. While the text is informative and important, it is the magnificent photographs that really grab the reader's attention. These are two beautifully produced volumes and we mane no apology for saying again: the photographs are wonderful! Highly recommended! Two amazing new books covering the golden years of the RAF. The simple joy with both is that a high proportion of the excellent photos are previously unpublished, and offer a wealth of aircraft nostalgia and colour scheme inspiration. These superb books should not be missed by any RAF fan. Two books of each around 300 pages full with my favourite pictures! Splendid books…without exaggeration. When you see the front pages with the formation of Hunters and Lightnings, than you are straight back in those years in which an enormous variety of planes flew within the RAF. The Second World War had only just come to an end. Not many countries can match the numbers and variety of the RAF. Keith Wilson was also inspired by it and therefore conducted these two books which just are a feast for the eye. Of each year, the most beautiful pictures of special moments, like maiden flights, inspections by the queen(! ), great formation of planes and much more. Almost all pictures come from the archives of the Air Historical Branch and Keith Wilson must have been there for many many hours, because to me these are really the most beautiful and unique pictures. They come in all kinds of sizes, black and white as well as colour and on good paper. More colour of course when going further in time. Wish I had been a photographer in that time! Each chapter in the books covers a year and starts with a summarized and good readable overview of the most important events in that year. All pictures that follow come with good interesting descriptions that tell something about the background of the picture. The author has given real attention to this. At the back of the 50’s book are a few appendixes that show how many planes the RAF had in operation. Keith Wilson really made a page turner with these books. This is how you make aviation books! On the back cover it says that more books will follow in this series. Count me in! Long-standing contributor to Pilot, air-to-air photographer and writer Keith Wilson, has produced two compelling illustrated books on the history of the RAF in the 1950's and 60's. Not only do they contain a unique collection of images that chart the changing face of the RAF from the beginning to the end of each decade, but they also provide a narrative that highlights specific events and outlines the development of the service in the wider context of what was going on in the country and the rest of the world at the time. Wilson's knowledge and passion for aviation lifts these books from being mere catalogues of the RAF's post-war years into fascinating records of how military aircraft and their roles changed over time. The images in the books have been given carefully researched and extended captions, containing the most salient information about the aircraft types depicted, as well as where and when each photograph was taken. Each of the books' chapters covers one year and there are appendices giving extra information in chart form, for example statistics from the 1950s on the strength of each aircraft, the manpower and the numbers deployed overseas year by year. Both books finish with a collection of RAF recruitment posters from the period that hark back to simpler time in advertising. Singly or together, these books would make excellent Christmas presents, not just for anyone who was involved with the RAF in those two decades, or who has a particular interest in the military history of this country, but anyone who experienced the twenty years of cultural change that brought us into the modern ear and wants an insight into what was shaping world events at the time. In this volume Mr Wilson concentrates predominantly on the aircraft and this, after all, is where much of the nostalgia fuelled dewy-eyed feelings come from to make a book like this work. The Exchequer throttled the RAF of the 1950s while it was trying to keep abreast of new sciences. On the one hand it was using venerable weapons from past conflicts while struggling to introduce imaginative new kit on the other. Austerity was the order of the day and nothing much has changed there. So a book like this will give you Spitfires and Sunderland flying boats in the same breath as the Canberra and V-Bombers. This is a lovely book. It is crisp and clean to look at and the photo reproduction is first rate. The captions are clear and easy to follow and this is essential if it is to appeal to people who remember those days of thunder or have affection for those times. I was born in 1959, so I don’t know where I fit in, but so many aircraft of the 1950s were still in service in my childhood it seems that the decades merge together. I am keen to see the next volume on the 1960s and hope we will see the 70s as well. Five stars. The books beautifully illustrate the RAF's aircraft across two decades that saw the World War Two classics leaving service, the Cold War greats, including the V-bombers emerge, and the introduction into service of the Mach 2 fighter. Individually or as a set, they have tremendous appeal. From the hand of famous aviation photographer Keith Wilson are two extremely sturdy, large-format bound books on the British Air Force. The reader will get a unique insight into the ins and outs of military aviation in these periods. If you have an eye for aircraft, just mulling over some of the language in the Foreword will put a smile on your face: the immortal symmetry of the Hawker Hunter, the brutal lines of the English Electric Lightning, the improbable shape of the Blackburn Beverley, the elegance of the de Havilland Comet. They tell you that this book has been put together by people with a real affinity for the subject. We usually cast a skeptical eye on publishers’ press releases or even the dust jacket blurbs but in this case they promise nothing the book doesn’t deliver. In fact, we could simply reproduce them and be done with the review! ... Anyone who spent time with the aircraft shown here will get misty eyes. Even just saying the storied names out loud will bring back memories of droning radials, shrieking turbines, and the smell of avgas. As featured in Klassiker der Luftfahrt magazine this book is laid out chronologically, showing numerous recordings from the 1950's helping to document the development of the Royal Air Force during this decade, with a broad overview of their patterns and their inserts. All the photos are from the historical department of the RAF and are fantastic quality. A must read for aircraft and World War Two enthusiasts alike. Numerous captioned black-and-white photographs illustrate these year-by-year chronicles of key decades in the Royal Air Force's history which saw the service introduction of many new military jet aircraft types, within the context of the development of thermonuclear weapons during what became known as the 'Missile Era' and overseas operations in Malaya, Indonesia, Cyprus, Kenya, Rhodesia, Aden and Libya, among other countries. Keith Wilson has been actively involved in aviation publishing for more than 30 years and is probably best known for his striking air-to-air images in Pilot magazine. He has almost 2,000 air-to-air sorties under his belt and has photographed a very broad range of subjects, from gliders, vintage and veteran, aerobatics and general aviation right through to high altitude research aircraft, biz jets, commercial jets and military fast jets. During this time he has amassed a photographic archive well in excess of 250,000 images. He is the author of Red Arrows in Camera and Battle of Britain Memorial Flight in Camera, published to great acclaim by Haynes in 2012 and 2013 respectively. Keith also contributes photographs and articles to magazines and publications around the world.